Jeff Dawson continued his good early-season form to win the Letchworth 14-point Advanced event with an unblemished 100% record. The single-day event saw nine players, in the handicap range -1.5 to 2, complete 28 games in around eight hours. Rather surprisingly, with 80 minute time limits having been applied, only four games went to time. Despite numerous attempts at peeling turns, the day’s only success was that by Jeff who completed a very controlled straight TP in his game against Nick. This was the only 14-point Advanced event in this year’s CA calendar and it proved to be a huge success. Everyone enjoyed the day (helped by nice weather and excellent courts) and with plenty of interaction, unique challenges and limited sitting-out time, it’s a fixture that will definitely be repeated next year. As far as a single-day format goes, the format is hard to fault. Hopefully other clubs will follow suit next year. Nine contestants with handicaps ranging from 3.5 to 18 enjoyed some good handicap croquet on the magnificent Letchworth turf. The going was good and it soon became apparent who had the winning post in mind when David Frost (10) , in his first game, beat Robert Skeen (7) by the convincing margin of +23 and in the course of this qualified for his bronze award. No other games in rounds 1 or 2 stood out although David Frost’s destruction of fellow Enfield player, Tony Elliott (9), enhanced his credentials. Heather Bennett (12) was meanwhile steadily coming along with the leader until the a hurdle in the shape of Mike Bowser (3.5) put a stop to her progress. And so to the second day with the manager putting David and Heather together in a head to head. The crowd stood open-mouthed as Heather raced to a +24 win leaving both players on 75%. The eventual winner was uncertain until the final stroke of the last match on court was struck. Heather beat Tony Elliot +4 whilst David beat Peter Whiting (8) +6. Heather was proclaimed winner on the basis of who beat whom, both players having 80% success. Six Letchworth members plus two visitors from Peterborough took part in our inaugural 14-point High Handicap AC Tournament. Several were playing in their very first ‘official’ tournament, and all coped well with the demands of playing 5 games during the day. Not much separated the majority of the field, but there was a runaway winner who won all five of his games – Roly Iddison from Peterborough, just beating Peter Aspinall in the final on the golden hoop decider. Nigel Polhill won at Letchworth again! 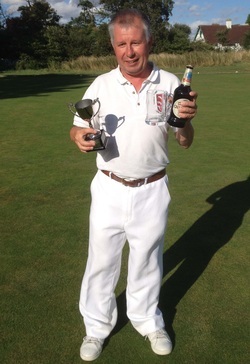 Nigel Polhill won Letchworth's A class event which attracted a strong field of 9 players from +1 to -1.5. 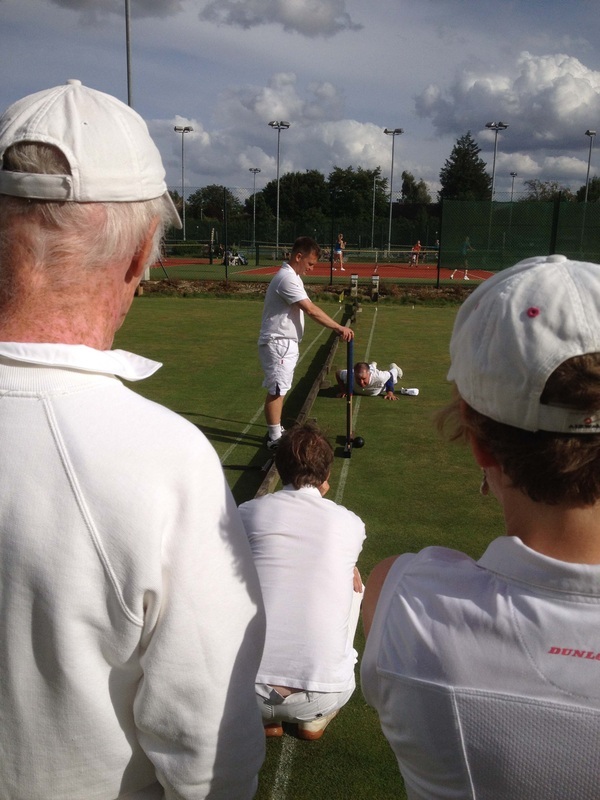 Saturday featured a four hour game between Simon Hathrell and Jerry Guest. This was won by Jerry but Simon strained his back in the process and had to withdraw from the tournament. Play stopped when Debbie Lines over hit a roll and, watched by everyone else, it took two referees to decide eventually that the ball was in. Sunday was “Hurricane Bertha Day” which brought heavy rain at times and some great thunder and lightning. By mid afternoon the main contenders had played their 6 games and all jumped ship not knowing the final result because it depended on the outcome of the last game Nigel v Jerry Guest which started at 4pm in brilliant sunshine and was won by Nigel +8 at 6pm. In first place Nigel had 83% wins, Jack Wicks was second with three triples and 71% wins. Third was Ian Lines with two triples and 66% wins. Debbie Lines (one triple) and Duncan Hector finished with 3 wins each, Jerry had 2, Nick Steiner and David Marsh had 1 win each.